Since CloverETL 3.0, these attributes are deprecated. They should be replaced with either SKIP, or STOP return values, if processing should either continue, or stop, respectively. Any of these values means that a fatal error occurred and the user decides if the process should stop or continue. To define what should be done with the record, click the Error actions attribute row, click the button that appears and specify the actions in the following dialog. By clicking the Plus sign button, you add rows to this dialog pane. 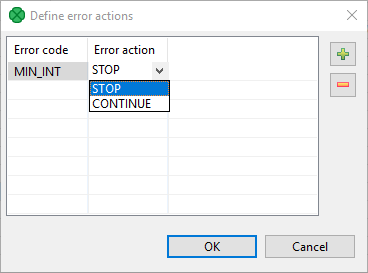 Select STOP or CONTINUE in the Error action column. Type an integer number to the Error code column. Leaving MIN_INT value in the left column means that the action will be applied to all other integer values that have not been specified explicitly in this dialog. The Error actions attribute has a form of a sequence of assignments (errorCode=someAction) each separated by a semicolon. The left side can be MIN_INT or any integer number less than 0 specified as some return value in the transformation definition. If errorCode is MIN_INT, this means that the specified action will be performed for all values that have not been specified in the sequence. The right side of assignments can be STOP and/or CONTINUE. If someAction is STOP, when its corresponding errorCode is returned, TransformExceptions is thrown and the graph stops. If someAction is CONTINUE, when its corresponding errorCode is returned, error message is written to Console or to the file specified by the Error log attribute and graph continues with the next record. -1=CONTINUE;-3=CONTINUE;MIN_INT=STOP. In this case, if the transformation returns -1 or -3, the process continues, if it returns any other negative value (including -2), the process stops. In this attribute, you can specify whether the error messages should be written on Console or in a specified file. The file should be defined using URL File Dialog.